One of the funniest and most revealing things coming out of the upcoming Democratic convention is how Democrats will NewSpeak the name of the very place the convention is being held. Because their entire case for reelection is class warfare, the Democrats have decided not to call Charlotte, North Carolina’s Bank of America Stadium Bank of America Stadium. Democrats changing the language, facts, and calling something it’s not is a time-honored tradition. Tax increases = investment; tax cuts = government spending; illegal aliens = undocumented workers; destroying two thousand years of tradition = marriage equality — and on and on. According to Todd: P-A-N-T-H-E-R S-T-A-D-I-U-M (14 letters) is shorthand for B-O-F-A S-T-A-D-I-U-M ( 11 characters). And this is on Twitter where every character counts. Also, instead of correcting himself, Todd lashes out when he was the one who got it wrong. On the list of Todd’s sins, this is small potatoes, actually, especially when compared to the shameless race-baiting he did live on-the-air during the Republican convention. Of all the media low-points during the convention, none was lower than Todd walking around the convention floor as he accused the GOP of using non-white convention-goers as tokens and seating them for maximum camera effect. 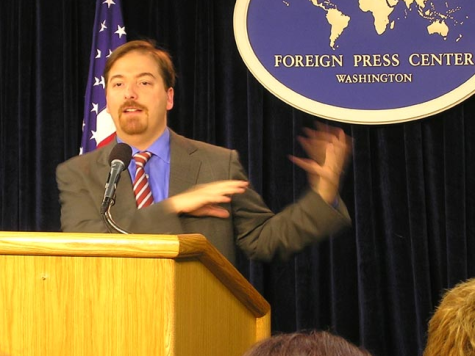 Todd it a taking point machine for Obama, one of the most shameless shills in media right now, and the NBC News Chief White House Correspondent. My guess is that going forward, the media will do everything in its power to avoid situations where they have to speak or write the name of the stadium. Our friends at Twitchy have more.